“Do I have to ask her dad for her hand in marriage?” My son’s voice crackled over a bad connection. Just when I thought I’d taught him all his life lessons—be kind, brave, happy; handwrite thank you notes, buy lemonade from kids, and call your mother regularly—there was more. We hadn’t talked about proposing in the 21st century. Asking for a woman’s hand in marriage seemed to me to be necessary only for a character in an 18th-century novel. And what about asking her mother? I imagined how I’d feel if left out of that conversation—if I had a daughter. So we discussed whether her parents had a sense this proposal might happen and if they’d approve, plus whether he was comfortable asking his future wife first. Letting her be the decider. Expecting a yes, he concluded there’d be time to ask for her parents’ blessing. My son proposed by the light of a rented pick-up truck, using a placeholder ring. Let me back up. Actually it was more romantic than that sounds. 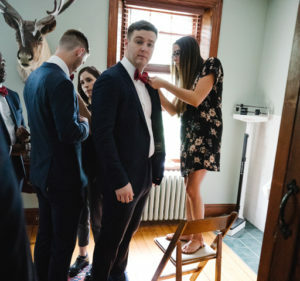 After all, in an era of over-the-top prom-posals—invitations to high school proms—a future groom has to invest some effort. And the placeholder ring? 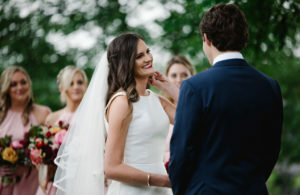 That’s a new thing and one the groom has shared with friends—to allow a 21st-century woman with very particular tastes to design the ring she’d wear, one hoped, forever. And that’s also Instagram-worthy. Although most grooms may not have specked out their weddings to the extent of many brides, there’s still thought, effort and prep required. As well as roles for their family. And since the bride had her vision, the process ran apace, thanks to help from an all-star MOB. I happily stayed on the sidelines, as did my husband (the FOG, if that’s a thing)—suggesting local venues, checking out vendors, tasting wedding cake. No decision-making responsibilities, just fun. The groom agreed. So long as there’d be a great party with family and friends, he’d be happy. His goal was to ensure his future wife got the wedding she wanted. We were unified. After securing his perfect bride, the groom’s attention turned to his contribution to the wedding party. As an only child with a long list of friends, he needed diplomacy and toughness. Brothers of the bride? Close circle of friends or track teammates? That’s over 30. Maybe have a 5K race with top finishers earning a spot? In the end, only one twin bestie but both future brothers-in-law made the cut. The best man was a track teammate since ninth grade, reliable and up to the job. And although simpler than choosing bridesmaid styles, colors and fabrics, deciding on the groomsmen’s attire is not without peril. Having rented an assortment of tuxedos for other weddings, the groom had a plan for his own. His gift to his groomsmen would be their custom wedding suits. Working with a college friend at the e-commerce company Bonobos, the groom coordinated measurements for the guys around the country and ordered their dark navy suits. At Christmas, he delivered his surprise gifts. The groomsmen’s task was to stay the same size for the next six months—no bigger, no smaller—to fit into their trimly tailored suits. This story breezes over events on the much busier bride’s side—the subject of many more articles, movies and blogs. Yet, the groom had a few more tasks—organizing hotels blocks, arranging gifts for the bride’s extended family (excellent in-law investment), preparing remarks, not to mention writing his vows, toasts and the wedding-day letter to his future wife. Free from details like choosing the chair style for the reception, the groom could plan the mini-moon—a shorter getaway for those with demanding careers and limited vacation leave. Four days on the pink sands of Bermuda, less than a three-hour flight away. Done. And also plan the pre- and post-wedding parties. 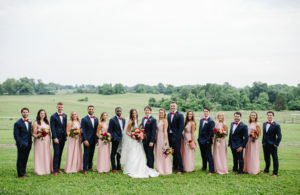 Then it was just a matter of showing up to scheduled events—rehearsal, rehearsal dinner, wedding, reception, after-party, farewell brunch—on time, properly attired, accompanied by all eight groomsmen and one wedding ring. The rehearsal dinner is a major item on the groom’s To-Do list. Or his parents’. The groom happily delegated the details after turning over carefully negotiated guest lists. The groom’s one request: a convenient and informal gathering where both families and all friends could freely mingle to start off the weekend. A favorite brewery had a private second floor, so La Cabra in Berwyn filled the bill. A delicious Southwestern-inflected buffet and plenty of great craft beer (and wine for those who must) lubricated the meeting and greeting of seldom-seen family, family-to-be, out-of-towners, along with the wedding party. The absence of photos from this event—but for an iPhone shot of the track-shoe-shaped groom’s cake—demonstrates that the bride’s side was much better with the details. Rather than a salon day, the guys opted for a five-mile run on the groom’s favorite course at Haverford College. Next, a quick lunch from Wawa, another groom favorite, then showers. Luckily all suits and ties fit and the custom French-cuff shirts arrived on time. Was there primping? The groom submitted to having his hair brushed into something resembling a style. Others were more meticulous, requesting hair spray for the humid afternoon. Rather than risking amateur skills, a bow tie specialist was enlisted (she later confessed to recently prepping from the Internet). After the groomsmen headed for the ceremony, plastic shirt bags, wooden suit hangers, faux-leather cufflink boxes and random drinks dotted all surfaces. Wet towels and smelly running shoes dropped on floors around the house were a glimpse of what life with nine sons might be like. This is the bride’s day. The groom merely avoids seeing the bride pre-ceremony, remembers his vows and toasts, checks on the ring, and has a few words with his future father-in-law. A few more groom’s duties: the first dance to a favorite song, in this case Thomas Rhett’s “Happy Man,” mentioning the Northern Lights. 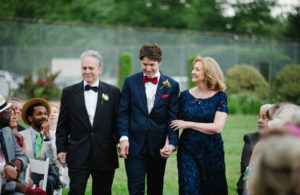 Then a dance with his mother, to which other mothers attending were invited to join—after all, the bride’s mother, who had two sons among the groomsmen, had arranged this party. She should get to dance! Even with a great reception band and dancing until all jackets, most ties and many shoes were cast off, the after-party extended the celebration. Returning to Wayne, near the guests’ hotels, the after-party was enough fun to attract two wedding crashers, who unfortunately weren’t as smooth as Owen Wilson and Vince Vaughan. Celebration #4 was a late Sunday brunch at the groom’s parents’ home. So technically the groom is involved in this, too, and, he sincerely wanted to man the grill for a BBQ. Since this would be the morning after the after-party, caterers made for an easier Sunday. 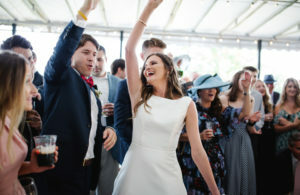 A happy crowd turned out to fill the house for a warm farewell, oblivious to the tent that collapsed on the lawn from yet another summer downpour. Through it all, the groom managed to keep his rather large gift to his new wife hidden until the end—a Ford truck, suitable for trailering her horse and hauling their wedding gifts. The couple headed for JFK airport, for the Bermuda mini-moon, which became a many-moon (now also a thing) as the couple continued to plan more trips over the next months. At the couple’s request, leftover food and wedding flowers were shared with a local senior community and West Chester shelter, including gluten-free goodies from the cookie table. And yes, the couple’s thank you notes, which included wedding photos of each guest, were all handwritten. Hair Cut: Dibonaventura Barber & Styling, by Al, Jr.
From proposal to honeymoon, grooms around the world celebrate marriage in many ways. Though cultures may interpret the traditions differently, ultimately it’s love that binds us together (in some cases, literally). The name “groomsmen” is taken literally in Greece, where the groom’s best man (koubaros) becomes his barber by shaving his face. The bride’s sisters and female cousins steal the groom’s shoe in Pakistan. If the poor guy wants it back, he must pay a ransom for its safe return. It’s customary at Jewish weddings for the groom to dine with male relatives before the wedding. The groom’s reception includes prayers, toasts and signing of the Ketubah (the Jewish marriage contract)—not exactly an American bachelor party. In parts of Italy, the groom and his family throw a party, or “serenade,” in the streets outside the home of the bride on the wedding day. The melodious Romeo sings to his Juliet until she appears. Russians have a tradition of setting up obstacles for the groom on his wedding day. The groom must complete physical tasks, answer questions about his bride, and unveil his hidden fiancée before they can officially get hitched. In Pakistan, grooms get veils too—a “sehra” is a headdress worn for protection against evil and often adorned with a veil made of beads or flowers. In Sweden, if the groom leaves the room for any reason, all the other men at the wedding are allowed to kiss his bride. Falaka, or Beating of the Groom’s Feet, is practiced in South Korea. Before the groom can leave with his bride, he must weather a beating of the feet with a stick, cane or dried fish (yes, you read that right). Fijian grooms present their future brides or father-in-laws with a tabua—a polished sperm whale tooth symbolizing atonement or esteem and traditionally used in rival chief negotiations. And in the southern states in the U.S., to keep rain away on the wedding day, the groom and groomsmen must bury a full bottle of bourbon upside down at the wedding location exactly one month before the day. The idea of the groom’s cake migrated from Victorian England into the heart of the American South and beyond. Today, many couples add a cake made specifically for the groom to their receptions. 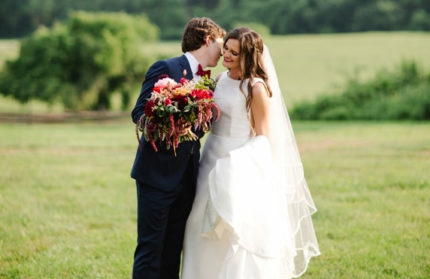 Interested in some general wedding trivia? Read on. “Vein of love”: wedding rings are often placed on the third finger of the left hand because ancient Egyptians believed the vein in that hand ran directly to the heart. “Handfasting” began during the Middle Ages, when it was a common custom to tie the bride’s and groom’s hands together during the ceremony. The couple could not be released until the marriage was official. This tradition is still practiced today in some regions, including Ireland and Great Britain. The symbolic sharing of cake dates back to ancient Rome. Today, a Japanese bride and groom drink sake together, Jewish couples drink from the same cup of consecrated wine, and Muslim couples eat from the same piece of candy. Russian couples share a sweetbread called karavaya and whoever takes the bigger bite—husband or wife—without using their hands is considered the head of the family. After the ceremony, the Scots wish couples well in a somewhat odd and odorous way. The bride and groom are barraged by their friends with every sticky thing you can think of—flour, treacle, custard. This “blackening” ritual is traditionally performed to bestow good luck on the happy (and smelly) pair. Though different cultures have different traditions, it remains a truth universally acknowledged that marriage continues to bring us together.